“A classic time for offbeat tactics is during the ‘in-between’ period of early summer, when walleyes bite both spinner rigs and crankbaits fairly well—but neither one like gangbusters,” Thelen said. With water temperatures in the middle of the road, climbing through the high 50s into the 60s, and neither cranks nor blades are exactly on fire, it can simply result in slow fishing. In this situation, Thelen suggests turning to hybrid cranking. Rigs like Lindy’s Lil’ Guy are dynamite for blending the best of both presentations into one technique. A relative newcomer on the walleye scene, the Lil’ Guy is basically a two-hook nightcrawler harness with a small, hard body in front of it. To further boost his odds of success, Thelen plays the hybrid rig card in areas many anglers overlook during the in-between phase of the post-spawn migration. Most folks leap-frog from shorelines that hold fish early in the season out to deep offshore structure, he says. Along with nightcrawlers, Thelen deploys other live bait. The rig comes with two hooks. To fish minnows or leeches, Thelen just clips off the rear hook. While the Lil’ Guy is built to run at speeds of .3 to 2.5 mph, Thelen keeps the pace between 1.3 and 1.8 mph. “Faster than a spinner, slower than a crankbait,” he says. At such speeds, a 1½-ounce bottom bouncer is perfect for keeping the rig in the strike zone. When the sinker’s occasionally ticking bottom and the line is at a 45-degree angle to the surface, you’re in business. Be forewarned, strikes can be savage, so hang onto your rod. When an ’eye attacks, an immediate response is in order. Don’t drop the rodtip or feed the fish line, just set and start reeling. Storm sewers, culverts and creeks are prime examples of potentially productive inflows. A constant supply of fresh water from nearby roadbeds, ditches and other sources often carries nutrients that attract baitfish. It can also bring in water that’s clearer than the main lake, especially when the lake has been roiled up by several days of strong winds. Water temperature can also be a factor. Before wetting a line, Thelen first identifies likely inflows on a detailed lake map. He approaches each with caution, keeping commotion to a minimum. Walleyes are spooky in shallow water, so ease in quietly. Pet presentations include pitching light jigs tipped with live bait, and fancasting small crankbaits. A 3/16- to 1/8-ounce Lindy Jig tipped with a spottail shiner or soft-plastic trailer is deadly. Small crankbaits like the size 3 Lindy River Rocker also excel around inflows. With both cranks and jigs, Thelen works 50 yards to either side of the inflow first, then the actual tributary. While crankbaits aren’t often considered early to mid-season options, Thelen works them into the mix well ahead of the crowd. 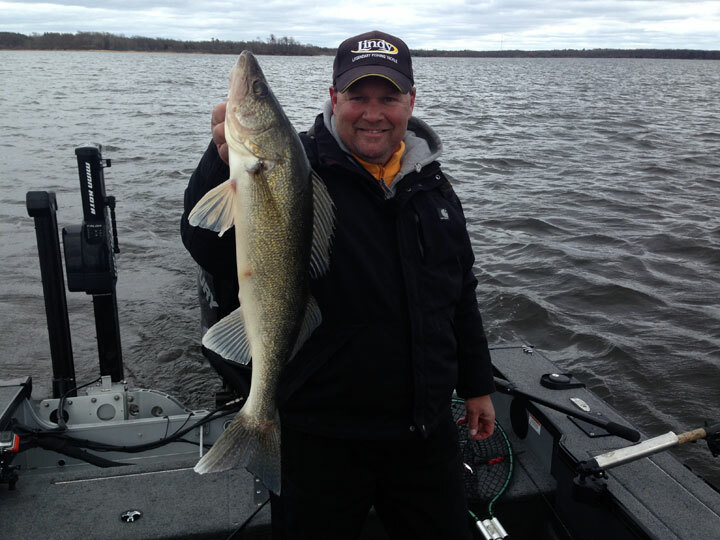 “Cranks catch cool-water walleyes in the shallows during low-light feeding periods and in 8 to 10 feet of water along the first break during the day,” he said. Here, too, a small lures like the River Rocker work wonders. Thelen prefers natural patterns such as perch, shiner, metallic silver and metallic gold. “Speeds of 1.5 to 2 mph are best until the water warms up in mid to late June,” he says. Given the relatively shallow water, he either runs the bait behind a planer board or long-lines it well behind the boat, ensuring the fish aren’t spooked before getting a chance to appreciate—and engulf—his cool-water cranking tactics.